Apart from aesthetics, when brick is selected for new construction, test data provided by the manufacturer is often reviewed for strength, saturation coefficients, and perhaps efflorescence. Unfortunately, another important characteristic—the initial rate of absorption (IRA)—sometimes receives little attention. This is the metric for water absorbed by the brick unit in a limited time, primarily through its bed face. Using brick with a high IRA can have significant implications for design and detailing of façades. 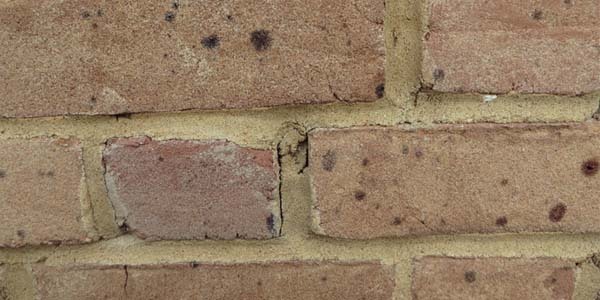 An example of bond-line separations between mortar and brick in masonry wall, using brick with a high initial rate of absorption (IRA). Both laboratory and field investigation have shown that strong and watertight joints between mortar and masonry units are not achieved by ordinary construction methods when the units laid have excessive initial rates of absorption. IRA also affects the selection of mortar. Brick Industry Association (BIA) Technical Note 8B, Mortars for Brickwork–Selection and Quality Assurance, recommends mortar with greater ability to retain mixing water be used with high-IRA brick, and mortar with lesser ability to retain water be used with low-IRA brick. The technical note’s Table 2 provides mortar recommendations based on brick unit IRA, generally leaning toward Type S mortar (per ASTM C270-14a, Standard Specification for Mortar for Unit Masonry) for brick with a low IRA, up to 0.0005 g/min/mm2 (10 g/min/30 sq. in. ), and Type N (also per ASTM C270) for brick with a high IRA, above 0.0016 g/min/mm2. Use of mortar or masonry cements is not recommended without testing for brick with high IRA that has not been sufficiently water-soaked before being laid. It is therefore important the specifier understand the physical characteristics of the brick when specifying mortars, and the specification clearly define pre-wetting requirements for the brick prior to installation. David S. Patterson, AIA, is an architect and senior principal with the Princeton, New Jersey, office of WJE, specializing in investigation and repair of the building envelope. He can be e-mailed at dpatterson@wje.com.